Today Is A Good Day!! Hello everyone! I’m here today playing along with the Muse Challenge #80 this week. The Muse this week is Therese Calvird. I wanted to keep this card nice and simple just like Therese card. I’m not really good with floral stamps. I never know what to do with them. So I used these blossom stamps because they are easier to maneuver to me. 1. I cut my card base out of Bazzill Marshmallow to an A2 size card (4.25 x 5.50 scored at 5.50). 2. My card panels are Stampin’ Up! Blackberry Bliss (3.75 x 5) and Hello Honey cardstock (3-10/16 x 4-14/16). 3. 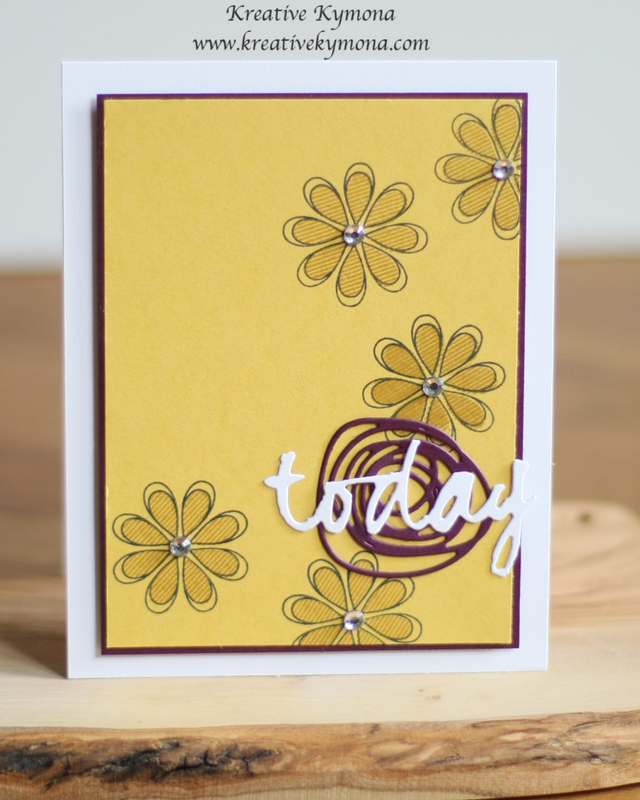 On the Hello Honey cardstock, I stamped Papertrey Ink’s Oopsie Daisy stamp set with Memento Black Ink. 4. I stamped the inside of the flower using the same stamp set with Hello Honey ink. 5. 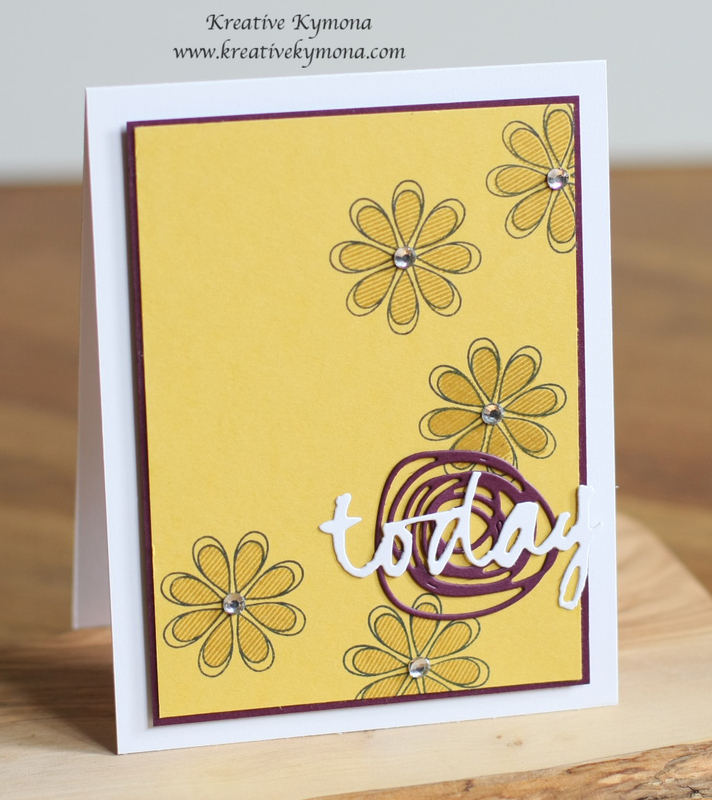 I used Papertrey Ink’s Circle Scribbles Die to cut out the medium scribble with Stampin’ Up! Blackberry Bliss cardstock. 6. I adhered that scribble piece with Tombow Multipurpose Glue. 7. I used Papertrey Ink’s Wet Paint Cuts II ” Today” from Bazzill Marshmallow cardstock. I adhered that to the scribble with Tombow Multipurpose Glue. 8. I added Stampin’ Up! Rhinestones to the center of the flowers. Very easy, simple card to recreate. So, what do you think? Do you like this card? Let me know. 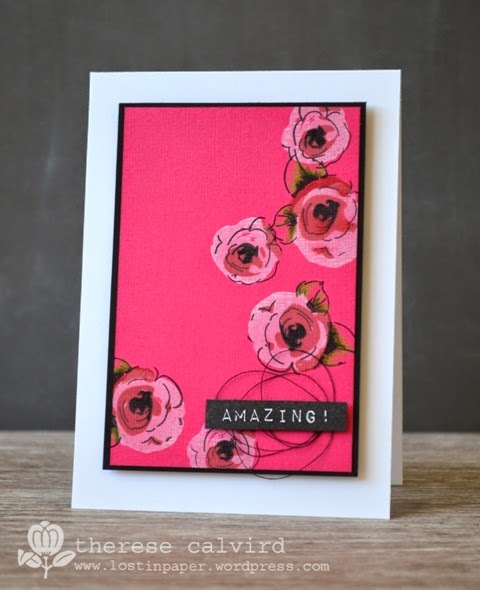 I don’t believe for one second that you struggle with floral stamps, your card is stunning Kymona! Hey Therese!! Thank you so much for your kind comment. Thanks for having confidence in me. I really shun away from floral projects because they never look good to me when I’m done. Thank you for challenging me. Love your sunny take on this week’s Muse – it looks great in these colours! Love the graphic flowers and the bright white sentiment! So glad you joined us this week! Hey Ardyth!! Thank you so much for your wonderful comment. Floral stamps are hard for me but I’m so glad you ladies challenge me to try them! Thanks for having me. Love this card!! The colors are fabulous together!! And that cool die cut is really fun – I have been seeing it a lot and it looks like a lot of fun to play with!! What a really gorgeous card!! Hey Taunya!! Thank you so much for your wonderful comment. Yes, that die is awesome and you would love to play with it. I love ur take on the Muse, so clean and crisp are those flowers. Absolutely awesome! Hey Deepti!! Thank you so much for your wonderful comment. I love your choice of colours here and that scribble die is awesome! Hey Anita!! Thank you so much for your kind comment. I voted for your card. Its awesome.